Ok, I normally do not rant on here but what I saw today I just cannot sit by and say nothing regardless that it may upset some. Today while working on a construction site I had to make use of the provided porta-potty. Once entering your eyes was drawn to words written by a marker at eye level; as you can see in the provided photo I took with my phone. What we have here for those who may not know is, one of the names that a messianic Christian group more known as Sacred Name movement use for the name of G-d.
As we can see that this dimi-god believing group has no knowledge of what holiness even looks like. Alongside of this name on the outhouse wall was also a Spanish version of the name Christian god. 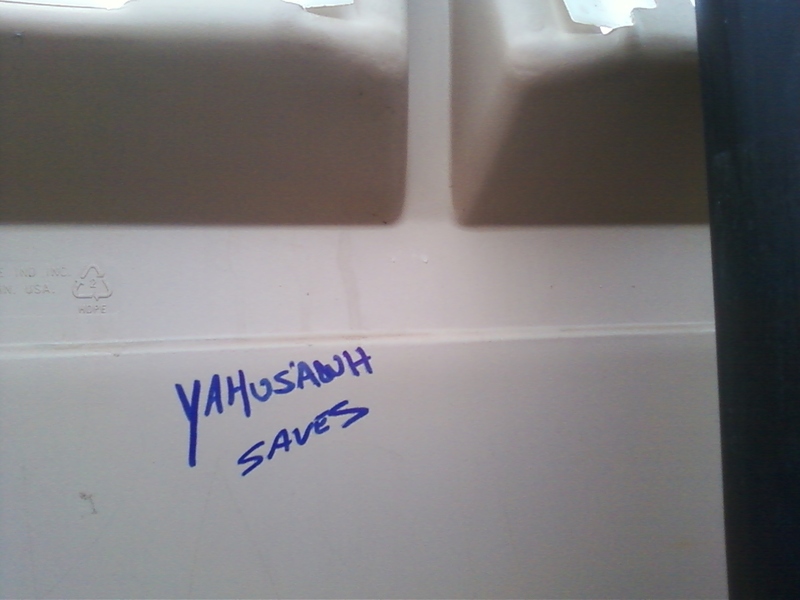 Maybe it is fitting for them to put the names of their gods on outhouse walls, I guess it is ironic. I do see these names many times in these same places from job to job. The sacred namers try to combine the true Sacred Name of the G-d, the Four Letter Name that is not permitted to be pronounced at this time with the name of a Hebrew version of the Christian god. For those who do not know, Torah Jews and Torah G-d fearing non-Jews known as Noahides do not say any of the permitted Names of G-d in the impure place of the restroom. We do not carry any books that have the Holy name in it into the restroom, we do not post any scripture in the restroom, and we do our best to not even utter a prayer in the restroom. G-d gave instruction to Israel on how to keep the camp clean of human waste. He told them to be very careful about these laws because He was walking in their midst. So even if these fools did perhaps write the Holy Name on an outhouse wall, what does this have to show about their care of the Name – It shows that they have no clue about the One True God and writing His Name on an outhouse wall is in violation of the commandment not to use the Name in a vain way. I would have to think that the guy who wrote this would not want the name of his mother or wife scribbled on outhouse walls just above where evey guy entering whips out his manhood and does his business, but he does not think twice to scribe his god’s name there. Kinda reminds me how a certain god in the past was worshiped as the worshipers would defecate in front of the idol. HMMMMM, maybe onto something here. Nothing new under they sun.